Reacting to the mixed record of the UK Human Rights Act 1998 and similar enactments concerned with the protection of human rights, this book explores ways of promoting human rights more effectively through political and democratic mechanisms. 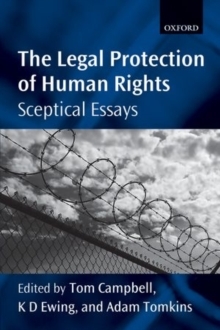 The book expresses ideological scepticism concerning the relative neglect of social and economic rights and institutional scepticism concerning the limitations of court-centred means for enhancing human rights goals in general. The contributors criticize the 'juridification' of human rights through transferring the prime responsibility for identifying human rights violations to courts and advocate the greater 'politicisation' of human rights responsibilities through such measures as enhanced parliamentary scrutiny ofexisting and proposed legislation. This group of twenty-four leading human rights scholars from around the world present a variety of perspectives on the disappointing human rights outcomes of recent institutional developments and consider the prospects of reviving the moral force and political implications of human rights values. Thus, contributors recount the failures of the Human Rights Act with regard to counter-terrorism; chart how the 'dialogue' model reduces parliaments' capacities to hold governments to account for human rights violations; consider which institutions best protect fundamental rights; and reflect on how the idea of human rights could be 'rescued' in Britain today. In addition, the book considers the historical human rights failures of courts during the Cold War and in Northern Ireland, the diverseoutcomes of human rights judicial review, and aspects of the human rights regimes in a variety of jurisdictions, including Finland, Sweden, New Zealand, Australia, Scotland, Canada, Europe, and the United States.